All types of travellers can take advantage of the discount accommodation at the Oaks Hyde Park Plaza, as well as the range of modern amenities including child minding, guest laundry, gym & fitness equipment, lift, sauna, spa, tour desk, fee pay parking and 24 hour reception. 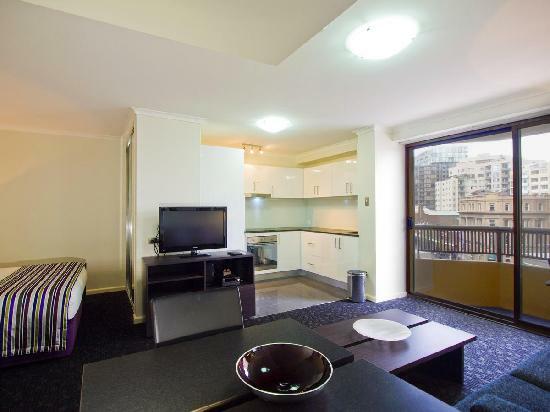 The spacious suite-style accommodation at the Oaks Hype Park Plaza Apartments gives you the freedom to cater for yourself and really feel right at home while in Sydney. Alternatively, take advantage of our service and just relax and enjoy yourself on the rooftop recreation deck, heated swimming pool, spa and sauna. Whether you choose a studio, 1 or 2 bedroom apartment you will find all the facilities you need on hand at the Oaks Hyde Park Plaza Apartments. Nearby Attractions : Due to our perfect central location, Oaks Hyde Park Plaza provides easy access to Sydney's main attractions, Darling Harbour, Sydney Opera House, Circular Quay, Art Gallery, Bondi Beach, Fox Studios, Hyde Park,Botanic Gardens and Chinatown. 1 Bedroom Apartment : Sleeps up to 3 guests on 1 King Bed, Or 2 Single Beds, Plus A Rollaway Bed If Needed. 2 Bedroom Apartment : Sleeps up to 5 guests on 1 King & 2 Single Beds, Plus A Rollaway Bed If Needed. Refurbished Studio : Sleeps up to 3 guests on 1 King Bed, Or 2 Single Beds, Plus A Rollaway Bed If Needed. Studio Apartment : Sleeps up to 3 guests on 1 Queen Bed, Plus A Rollaway Bed If Needed. Studio King/Twin Apartment : Sleeps up to 3 guests on 1 King Bed, Or 2 Single Beds, Plus A Rollaway Bed If Needed.